Why does Ofelia crawl into the toad's grotto? If there's one thing that's consistently omitted from most Disney fairy tale adaptations, it's abject horror. They certainly make up for it by giving us terrific villains (Maleficent still haunts me), but a lot of the foul and gory details are left out. Fairy tales aren't meant to be enchanting; they're supposed to be cautionary, terrifying even. Stories with female protagonists--like Cinderella and especially Snow White--reflect aging housewives' fears of being usurped by younger, stronger, fertile women. In some versions of The Little Red Riding Hood, the grandmother is essentially cannibalised when she's eaten by the wolf, who's then eaten by Red. In Heinrich Hoffmann's Der Struwwelpeter collection--a "gift" for his son--children are at the brunt end of severe punishments. One thumb-sucker gets his thumbs cut off, a girl who plays with matches gets burned, and a boy who won't eat his soup dies of starvation. Fun fact: Hoffmann was a psychiatrist.In many interviews, Guillermo Del Toro has talked about his fascination with the "deeply disturbing" nature of fairy tales. 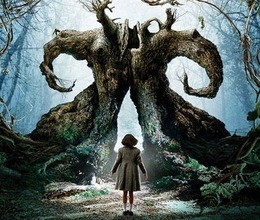 It's why they lend themselves so seamlessly to "Pan's Labyrinth,"a story about a young girl, Ofelia, who'd rather deal with the horrors she creates herself than the monstrosities chosen for her by Francoism. 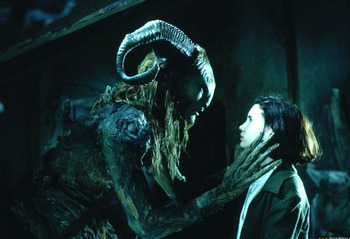 "Pan's Labyrinth" takes an allegorical approach to fairy tales by drawing parallels between both of Ofelia's worlds. But because Guillermo Del Toro is such a skilled storyteller, it's not merely a question of matching similarities. There are important differences that feel like commensurate opposites. In the faun's world, Ofelia is a heroine. In reality, her stepfather Vidal thinks she's a disposable pest. Each time Ofelia regresses into fairyland, she's escaping a real-life unpleasantness.The first time Ofelia encounters the faun's enchanted dimension, she invokes it with her own story. She's just arrived at Vidal's countryside manor, barely able to mask reservations about her new life. Her pregnant, bed-ridden mother asks Ofelia to tell the baby a tale, hoping the unborn child will hear it. Ofelia's anecdote doesn't have a proper beginning, middle or end. It's almost like it's waiting, like its character: a single rose that lives atop a lonely mountain. It has the power to give immortal life to anyone who will pluck it, but no one dares because its thorns carry a deadly poison.We want to imagine that the rose is Ofelia, beautiful and alone in her new home with a perfectly indifferent father figure. But on the tail end of the fantasy narration, the film cuts to a scene in Vidal's room where he's meticulously fixing his pocket watch. Since he clearly enjoys this kind of work, the scene characterizes his villainy. After all, doesn't a hint of OCD make baddies scarier? It means they'll notice details. Later that night, when her mother is fast asleep, Ofelia is visited by a stick insect that turns into a spritely fairy. It leads her to the eerie labyrinth she saw earlier on her way to the house. At the center of it, down a spiral stairway that leads to an underground lair, Ofelia meets the faun. 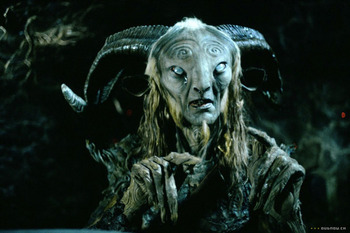 Played by Doug Jones, who could petrify audiences with a simple hand gesture, the faun gives the little girl an incentive to escape her current reality: he believes she's a princess in his. He gives her three tasks to perform before the next full moon. Their completion will prove that she is, in fact, "Princess Moanna." The first task involves getting a key from a giant toad. The only way to get it is to crawl into a muddy cave under a tree, place magical stones in the toad's mouth to make him regurgitate his insides, and take the key from his slimy entrails. Ofelia's timing couldn't be worse: her mother's dolled her up in a brand new shiny green dress for a dinner party that night. The event is important to her mother, who is desperate to please Vidal. It's also important to Vidal, who is desperate to brandish the image of a respectable family man to his guests. So why does Ofelia crawl into the toad's grotto knowing she'll disappoint her mother by getting all dirty? Maybe it's because she's already anticipating the dull dinner guests and their rigid, war-themed banter. She's also less interested in making Vidal happy than her mother is. Plus, she sincerely believes that in getting the key from the toad, she's working towards no longer relying on Vidal for support. To her, this foolish fairyland pursuit is a form of emancipation.The next night, the faun visits a very upset Ofelia in her room. She tells the faun that her mother's been very sick; she nearly miscarried. He gives her mandrake root to place under her mother's bed in a bowl of milk, promising that she'll feel better. Oddly enough, it seems to work. Even the doctor is baffled. With that worry off her mind, Ofelia can perform the next task. Using the chalk the faun gave her, she draws a door on her bedroom wall that takes her to the ghastly Pale Man's den. The lavish surroundings conceal an unfathomable horror: if Ofelia eats but one thing from the Pale Man's feast, he'll awaken and feast on her. The piles of children's shoes stacked up in one corner suggest a history of gruesome outcomes. Somewhat fittingly, the task is to retrieve an ornate dagger. We already know Ofelia isn't one for rules, so it's hardly surprising that she disobeys the faun and gives in to the feast's temptation. Also played by Doug Jones, the Pale Man is a merciless, cruel creature: one-track minded and not open for negotiations. When he's awake, there's always a child to eat. His dining room buffet is just for show. Ofelia barely makes it out, but what's interesting is that immediately after her escape, the scene cuts to Vidal's double-agent doctor chatting with one of the anti-Francoist rebels. They plan to attack Vidal, but the doctor wonders what difference it'll make. "They'll just send another, and then another," he says. Vidal is nothing more than the offspring a bigger, more dangerous, ultimately impermeable monster: ideology. When the faun visits Ofelia again, he condemns her for her recklessness. That's it. The deal's off. She's no princess! Yet it doesn't seem to bother Ofelia too much. With her mother feeling better, things are looking up. But then Vidal finds the mandrake root under the bed and hurls it into the fire. And then Ofelia's mother goes into premature labour and dies giving birth. And then the rebels close in on Vidal.Ofelia is running out of options. She knows it, and that's precisely when the faun comes back to give her one last chance. He asks her to bring her baby brother to his lair for the final task, unbeknownst to her that it'll involve sacrificing him using the Pale Man's dagger. 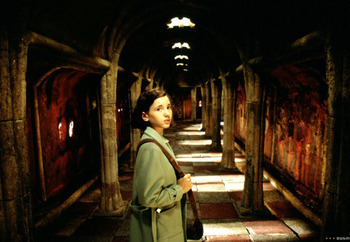 Ofelia successfully brings the baby to the labyrinth, but Vidal follows her and corners her. He tells her to give him the boy. When she does, Vidal ruthlessly shoots her. As she lays there dying, her expression conveys wide-eyed disbelief. How could this happen? She'd done everything she'd been asked to do. That's when she's transported to fairyland one last time. Maybe it's as perfect as she imagined it. Maybe it's the happy afterlife she deserves. Even the faun is there, welcoming Princess Moanna into a world that loves her. Whatever this place is, it's better than the life she's been dealt. Fairyland appears to Ofelia when she needs solutions, and while she's dying, it gives her a dignified end.Does any of it really happen or is it all in her mind? The movie proposes arguments that could support either theory. When a film does that, I take it to mean that it matters more to the characters than it ever could to us. Even Ofelia might tell you that she "really" imagined it. Olivia Collette is a writer from Montreal. She tweets as @olivia_collette and blogs at Livvy Jams..